Make a splash by sending a symbol of your love that will continue to grow year after year. Our miniature rosebush will arrive in bud and bloom and is available to surprise your special someone in on of two beautiful colors – red (shown) or pink or let our grower pick the one that looks the very best the day we ship your plant. 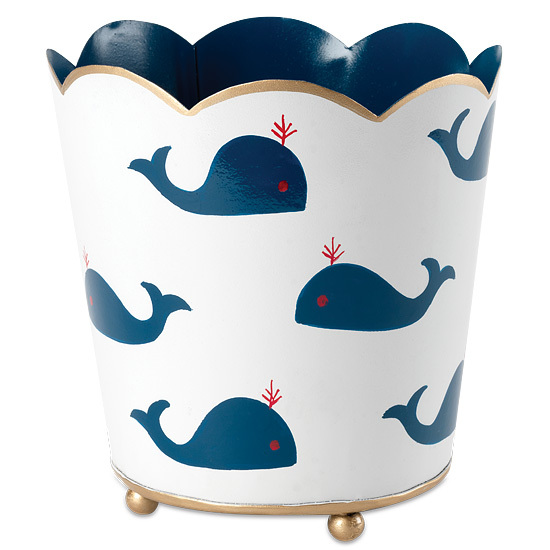 Our winsome whale pattern adds a playful touch to the footed cachepot which he or she is sure to love. Miniature roses can be grown indoors successfully but do require special care. Place your plant on a windowsill or in a sunny, humid area. You will know your rose isn’t getting enough light if its stems seem to stretch out leaving wide spaces between the leaves. Your plant will bloom indoors for up to two weeks afterwards we recommend planting it outside in a sunny area. Please note: Miniature roses have little to no fragrance.